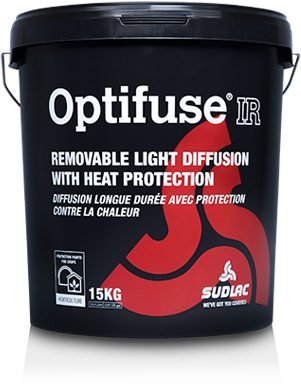 Optifuse® IR is a removable greenhouse coating that scatters the light to a high degree in combination with effective heat protection. Optifuse IR is very wear resistant and can be applied on the outside of all standard greenhouses. Optifuse IR is easily removed with Topclear at the end of the season. The Optifuse IR coating offers a very high level of diffusion and a high light transmission in combination with an effective temperature reduction. This combination will ensure more photosynthesis and lower greenhouse temperature. The incoming light is scattered by the diffuse coating layer, reaching the leaves from all sides from top to bottom of the crop. 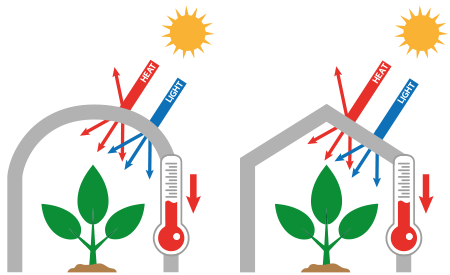 This will improve the photosynthesis and transpiration of all plant leaves, resulting in a better humidity, temperature and CO2 level inside the greenhouse. It is proven by research that diffuse light in combination with heat reduction has a positive effect on production, quality and growth of your crop. Compared to Optifuse, this Optifuse IR version reflects heat radiation (NIR) very efficiently while maintaining transmission of PAR. The PAR (Photosynthetically active radiation) is the spectral range of solar radiation from 400 to 700 nanometers that crops use for the process of photosynthesis. NIR is the spectral range of solar radiation from 700 to 2500 nanometers that is very efficient for generating warmth in the greenhouse. NIR is not used by the crop for photosynthesis. Optifuse IR needs to be diluted with water before spraying it onto the greenhouse. Depending on the method of application, type of greenhouse and climate, more or less water and buckets should be used to achieve the best result. Optifuse IR is preferable applied by machine to get an even layer for optimum diffusion. See How to use for more detailed information about applications and dosage. Optifuse IR is removable with Topclear at every desired moment. Apply Topclear in the advised amount and dilution maximum 3 days before rainfall. Read the complete instructions on how to use Topclear. Is Optifuse IR right for you? Try our online product advice tool to get advice.